The seven hour flight on Icelandair from Seattle to Reykjavik set off in the afternoon and arrived about 7-o-clock the following morning. The night, and a night’s sleep, had disappeared. Maybe that explains why the following morning we went down for breakfast at 4.30 thinking it was 9.30! I even chided the puzzled-looking hotel receptionist for not giving us an 8-o-clock wake-up call. I’d never realised hotels served breakfast at that time, but already a surprisingly awake party of Japanese tourists was happily tucking in. Icelandair is known as being a no frills long haul airline, but they supplied soft drinks and coffee throughout the evening/night; I had no complaints. Unfortunately Stage 7, the final part of my Round the World in 30 Days trip, started badly with the local car hire company having no knowledge of a car booked through Auto Europe. A black mark for a company I had previously found to be very reliable. However, after a short delay, we were furnished with a relatively new Toyota Auris. 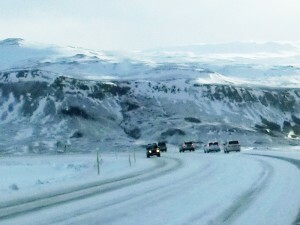 It had studded tyres that proved essential when driving around the Golden Circle. 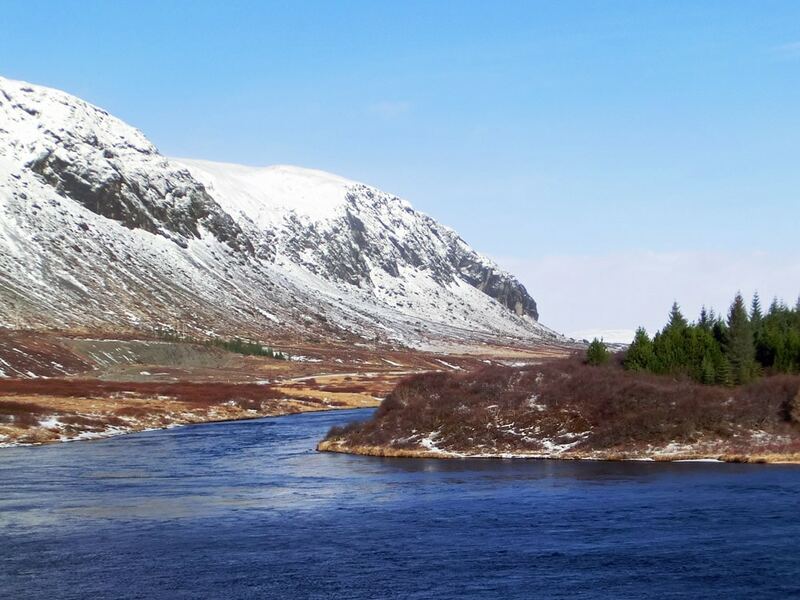 Iceland is about three-quarters the size of England – an awful lot to see in my two day stopover! 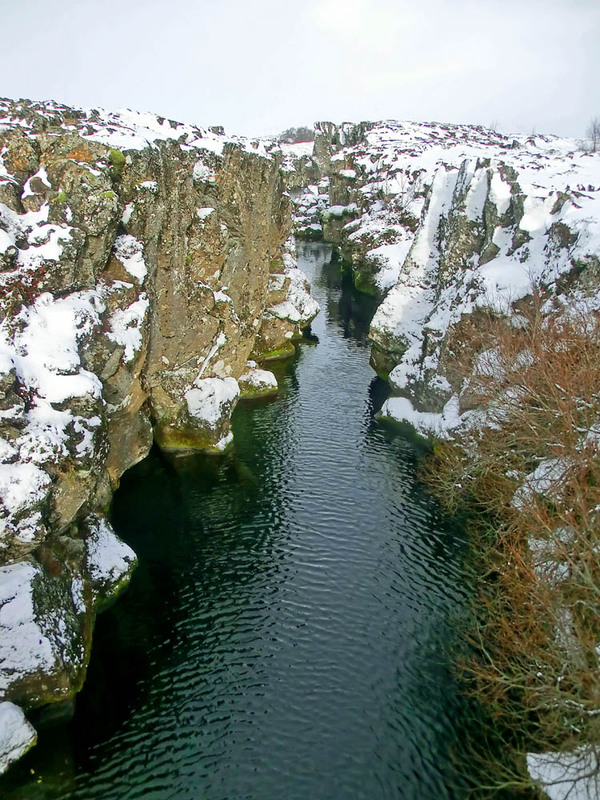 Hence, I limited my itinerary to the southwest corner: the Blue Lagoon and Reykjavik on the first day, and the 200 mile drive around the Golden Circle on the second day. 1. The Blue Lagoon. From Keflavik, where we were staying, to the Blue Lagoon is a short, but very interesting drive through the Reykjanes Peninsula, a barren landscape of black larval rocks. Steam hissed up from many fissures in the ground against a background of small volcanic peaks. I had been informed by all the guidebooks that you can’t visit Iceland without visiting the Blue Lagoon. And, yes, it was an enjoyable and unforgettable experience bathing in the hot waters with snow and ice all around. However, I’ve visited spas in Eastern Europe that are equally spectacular, but better maintained, for example Hévíz in Hungary. 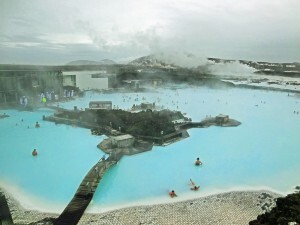 The Blue Lagoon is also relatively expensive at €35 (€40 in the summer) for an adult, with no Senior discounts. 2. 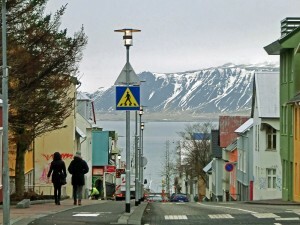 Reykjavik and Hallgrímskirkja Church. The central part of Reykjavik is on a peninsula, with streets of often brightly-coloured buildings sloping down to the harbour. The striking Hallgrímskirkja Church towers over the city centre. It was designed to represent the basalt lava flows of Iceland’s landscape. 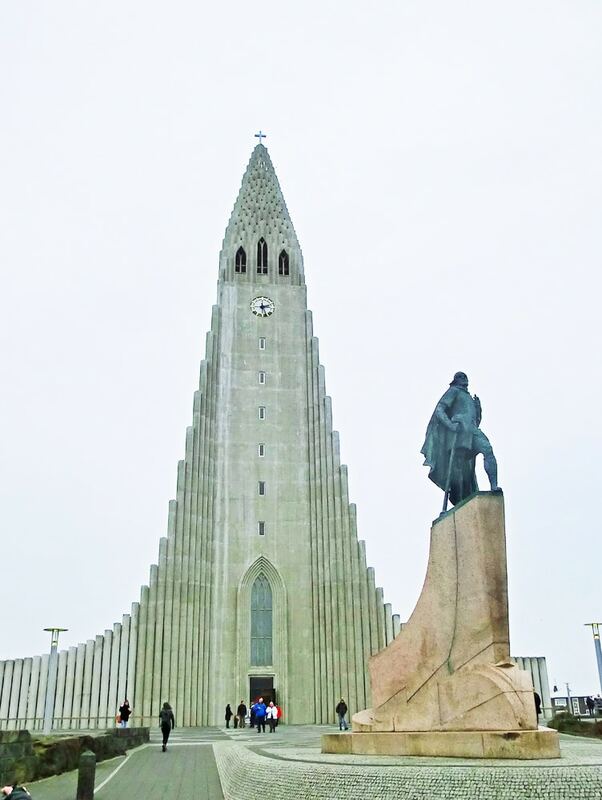 Dominating the church interior is an immense pipe organ; Icelandic music was being skilfully played when I visited – a very atmospheric experience. 3. Scenery around the Golden Circle. 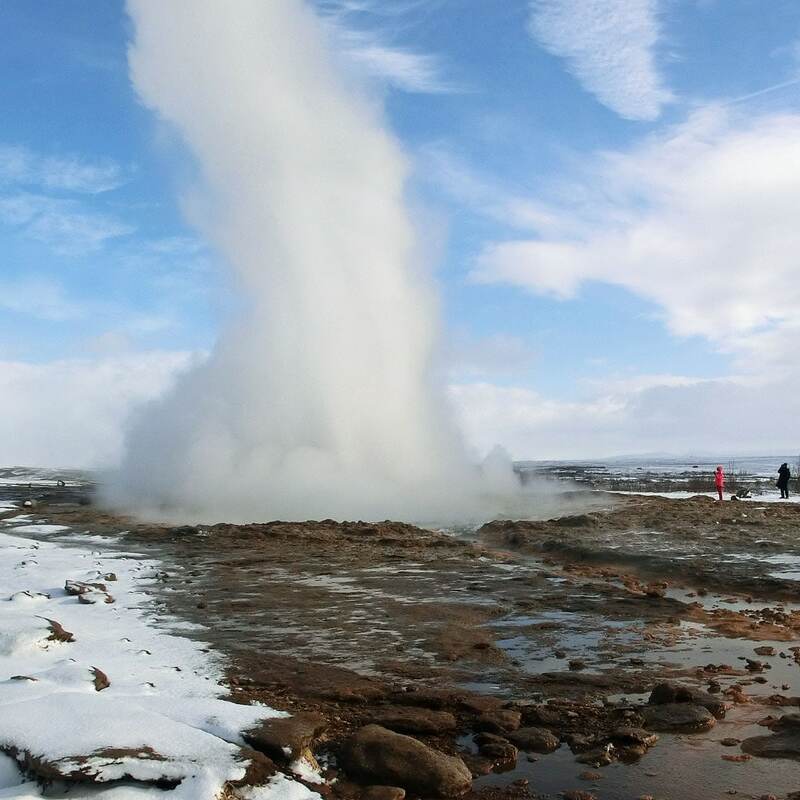 It was not particularly cold the day I drove round the Golden Circle – the temperature was hovering around 0°C – but a ferociously icy wind was sweeping in snow showers. 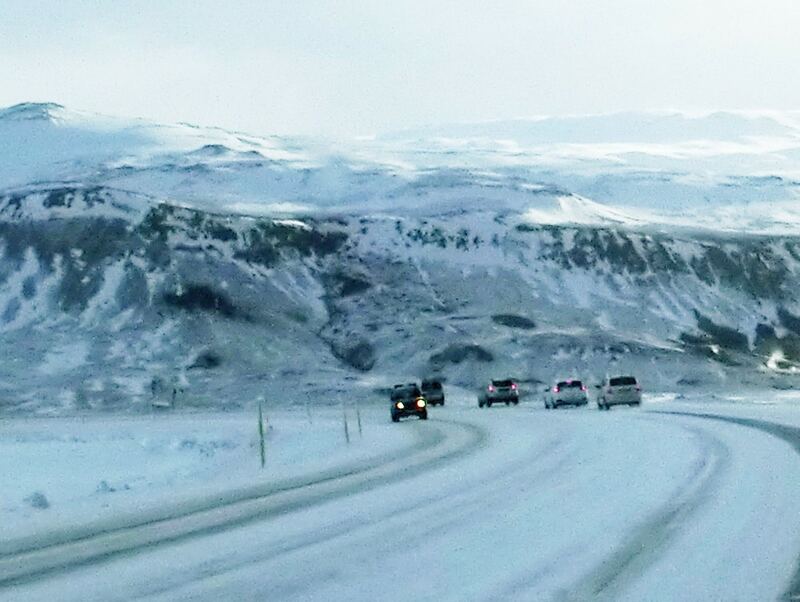 The initial 50 miles or so southeast from Reykjavik were quite difficult, with a constant stream of snowploughs needed to keep the road open. Turning northeast, the conditions improved and the scenery became more spectacular. We followed a river beneath towering mountain slopes, past small groups of thickly-coated horses and the very occasional village. After visiting the geysers and Gullfoss, the conditions improved on the road back to Reykjavik, with the rift valley lake, Thingvallavatn (Þingvallavatn), providing the scenic foreground. 4. Geysers and Gullfoss. The largest geyser, Geysir, is no longer active. I was a little disappointed with the smaller, but still active, geyser Strokkur, when compared with other geysers in California and Rotorua. 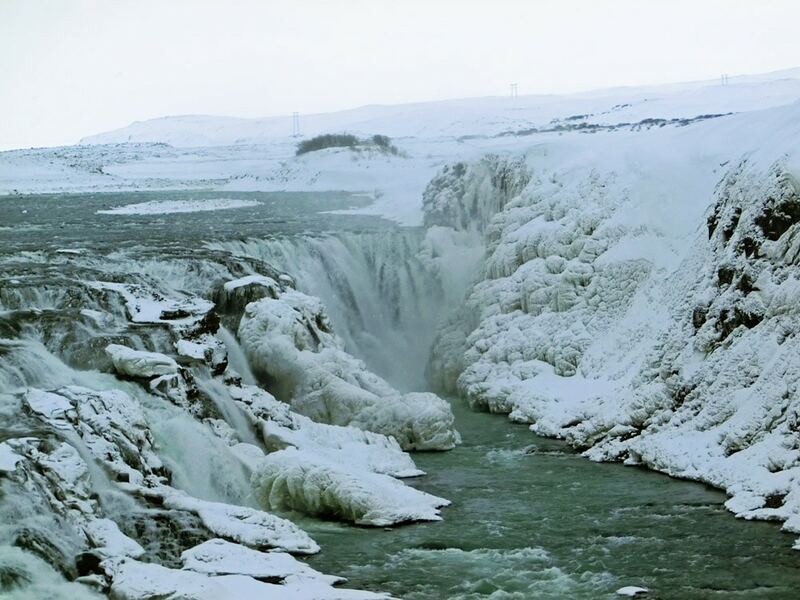 But just 7 miles down the road is the magnificent waterfall of Gullfoss which made the whole of the Golden Circle journey worthwhile. I’d have stayed much longer admiring this partly frozen waterfall, except for the biting cold wind that made it difficult even to take photographs. I’ll take my gloves next time! 5. Thingvellir (Þingvellir) National Park. This large National Park, containing Lake Thingvallavatn, is a popular tourist attraction, both for its dramatic scenery and as the site of Iceland’s first parliament in 930. I was particularly fascinated by the narrow water-filled chasm forming the boundary between the American and Eurasian continental plates. The prospect of an early morning flight persuaded me to stay near the International Airport at Keflavik, about 30 miles from Reykjavik. The Hotel Keflavik proved a good choice and relatively inexpensive. The rooms were small, but very well heated and the breakfast was excellent, even at 4.30 am! Iceland was a new country for me, number 71. It fitted with my preconceived ideas in that it was cold – very cold in the strong winds – and had large areas of barren volcanic rocks. What I didn’t expect was the great variety of beautiful scenery – and I’d only visited a very small corner of the country. I’d been warned about the high prices of food and drink; yes, maybe 50% more expensive than the UK. However this is not dissimilar to many other European countries. This short trip has whetted my appetite to return and I quite fancy circumnavigating the island. Maybe that should be timed for the warmer summer period – more amenable to Senior Travellers! But for now, an early morning flight to Heathrow and the conclusion of my trip. So, in retrospect, was travelling around the world in 30 days such a good idea? For an answer to that question see my Final Thoughts in Round the World in 30 Days.